Finally i gone through this 6 months...Glad to know so many nice colleagues. I really thank everyone in my department for guiding me so much.. I will miss my dearie a lot..i can't accompany him to work anymore..feel so sad...but still i need to continue with life geh. I still will meet him de..=) Still have time to be together with him before i go back to Melaka. I still have my langkawi holiday with dearie..so nice! My very helpful colleague and good friend Nicole..
Fairuz & I..the 2 trainees of Advisors. It was really happy working with all the colleagues from my deparment. Will really miss all of you! After work, we all went to Klang, Teluk Gong for seafood farewell dinner for Amy. I had mine in the afternoon with my boss but i didn't dare to take any pictures. haha.. Here are the stuff we ordered...yummy! Anwy, most of the pictures of food are quite blur..coz i took it fast and didn't wanna make my friends wait for me..keke..
YamSing~ We were drinking Thoddi. 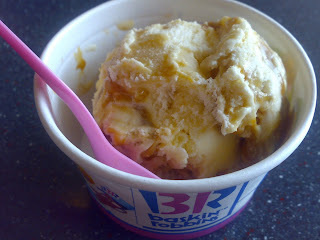 Can someone buy me Baskin Robbins ice cream? I wonder how i feel on the final day of training. I'm actually feeling very sad to be leaving, as i have known most of the ppl in the office. I'll miss my Senior lo..and i will definitely miss Nicole a lot. And then, feel sad that i cannot accompany my dearie to work anymore. I'll be back at melaka soon. Hope my studies goes well too. 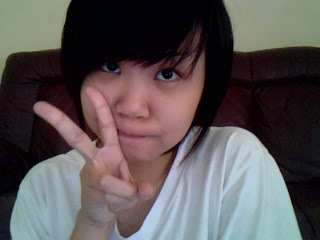 I'm going out wit dearie tmr!! Yippie!! Going for karaoke, shopping, TGI Fridays, movie (maybe? )...it's been a long time since we really went out to pak tor. So i'm reli happy lo. OK OK...gtg le. Have to get my beauty sleep. Hehe...nitez world! I'm now currently at Setiawan, Perak. Online-ing from my hotel lobby...the WiFi cant be detected in my room. How sien..
Anwy, i came here with my family, for seafood. Damn full now! We started our journey around 9am to Klang to fetch my Aunt and Uncle. On the way, we stop by at those roadside stalls for coconut. Yum yum! After that, we went to Lumut. And took lots of pictures..here's some for viewing pleasure. Update again when i'm back to KL! I'm not feeling well la..
Stupid! Why must girls suffer this?? Took panadol ady..it's getting better now. Not feeling so terrible anymore. But still..better than nothing la. hohohoho! 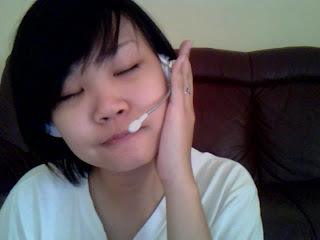 Anwy, i've been spending the whole morning...sitting in front of the laptop..listening to music. My ONE & ONLY entertainment..No music no life!! Yes yes...i know..what a fake picture. Haha! But seriously...i'm enjoying my music lo! 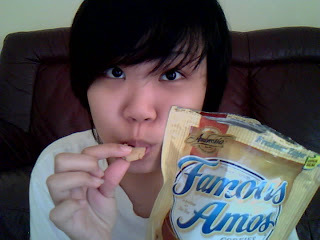 Other than listening to music, i'm enjoying my Famous Amos Cookies bought by my dearie tooo..YumYum! Want some? Anwy, i finally got stuff to do after my internship. Other than finishing my super-lot-of-pages report, my petsister Tracy ask me to be her model for her Beauty course exam on December 4th, and also from January 7th till 9th. There's like facial which includes cleaning, mask, and also some skin analysis, some massage, manicure, makeup exam, and also waxing. So anwy, 7th till 9th January's exam is at Melaka's Impres Esteem. So i'll be going to Melaka. (Friday) n then we stay till 11th come back KL rest a day, and then 12th we going to Langkawi till 14th. I think dearie will kill me lo...he will be so tired. Hahaha..
Few years back, i fell in love with this song. but haven been listening to it for a very very long time. Suddenly, i'm thinking of this song again. I guess..i'm feeling what the song is saying. Sometimes Love's Just Ain't Enough...and i agree with it. just to have somebody by my side. I don't want to take you, but I don't want to be the one to cry. And that don't really matter to anyone anymore. and I keep seeing you walk through that door. and it's sad when you know it's your heart you can't trust. There's a reason why people don't stay where they are. Baby, sometimes, love just aint enough. Now, I could never change you, I don't want to blame you. Baby, you don't have to take the fall. Yes, I may have hurt you,  but I did not desert you. Maybe I just want to have it all. It makes a sound like thunder, it makes me feel like rain. I keep thinking something's gonna change. And there's no way home, when it's late at night and you're all alone. Are there things that you wanted to say? there beside you, where I used to lay? and it's sad when you know it's your heart they can't touch. There's a reason why people don't stay who they are. Baby, sometimes, love just ain't enough. Baby, sometimes, love... it just ain't enough. After going to church today, i was super in the mood for Ice Cream. Yum Yum! So..i keep repeatingly telling Julia that i want BR. We went for Brunch. Chicken rice. I WANT BR LA!! So Miss Julia and I went over to BR at QueensPark. Last Wednesday i woke up early to make breakfast for dearie. 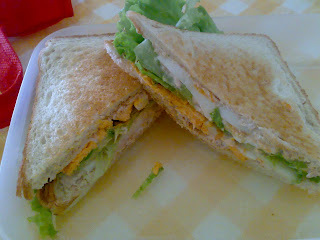 Nothing special, js a sandwich. 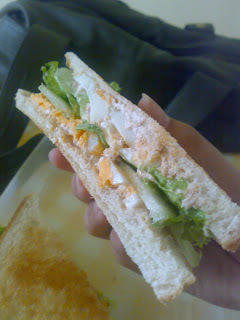 Toast bread + Tuna + Egg + Lettuce + Cucumber = My LOVE. hehe. I hope he feels sweet lo..keke. 1 more hour den can go back ady!! Tonite going to Midvalley wit darling o! Such a busy week..really need to take some time off and spend some time with dearie..
After that, we will be visiting Langkawi. Yippie! I'm really so excited about it. Excited about going for holiday with my dearie. 3 more weeks for my internship lo...After that, he will be driving to work alone. Nobody accompany him to work and back from work ady. But anwy, since i'm free..mayb i could come find him for lunch once in a while..hehe..
Good luck to me for the rest of the 3 weeks! Waited for Darling in the office today coz he needs to OT to finish some work. Felt really sweet even though it's just some simple food. 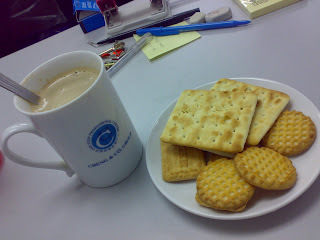 He purposely went down to make the drink for me and got me biscuits coz he don't want me to feel too hungry..
=). Thanks dearie....Love you so much. Now..i'm too full for dinner. Haha.